For the Collection of Odd, Queer, and Curious Things. Boston, MA. Publisher: Quaint Publishing Company. 1/1, January 1901. 32-18 pp., 50 cents a year. Constant advertisements in Adiramled, 1902, and in the Philomathian, describing it as “An odd magazine filled with Quaint and Curious things." Among these were humorous advertisements from newspapers, anagrams to be solved, notes of a “human skull as big as a bushel basket" in Sicily, “Prehistoric Palmistry," and the like, but underlying these curiosities was the publisher's interest in the byways of the occult, astrology and New Thought. With each subscription came an astrological delineation. The journal was published anonymously, but the editor/publisher was Amos Woodbury Rideout, a pharmacist and Dickens scholar, who widely advertised “pure books on AVOIDED SUBJECTS," including, presumably, T.H. Burgoyne's The Language of the Stars, which he offered for sale in the journal. 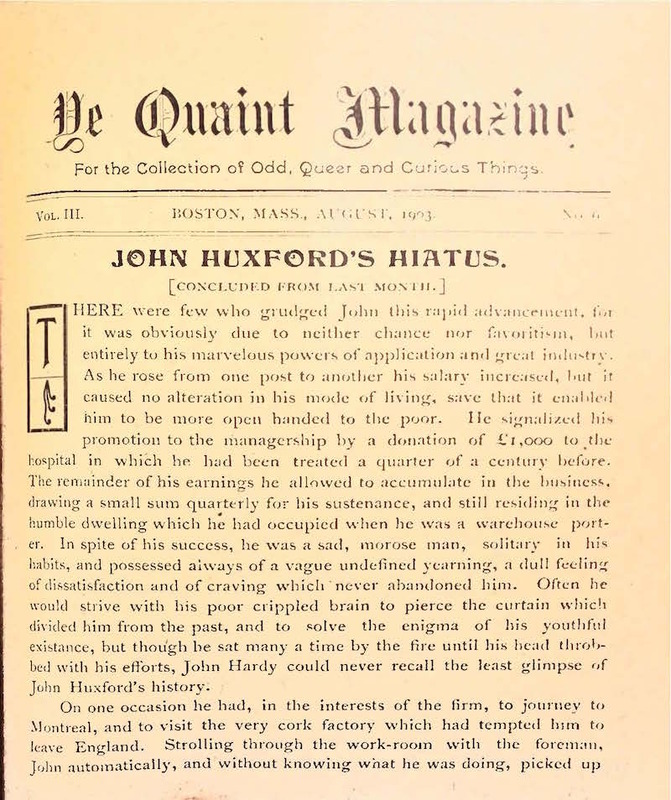 The journal attracted advertisements by many of the small, lesser known New Thought-occult journals of the time, like the Wise Man, Occult Truth Seeker, New Life, Opportunity, Suggestion, Planets and People, the Nautilus, Health Messenger, the Adept, Fate, the Magic Mirror, Now, and also carried the widely disseminated advertisement by “Dr. J.T. Betiero" of Chicago on his “credentials from the Hindoo Priest and the Dalia-Lama of Thibet." The journal featured a column on astrological lucky and unlucky days for the coming month by “the famous Boston astrologer," Dr. Derolli. Contribution by J. William Lloyd. As 1904 progressed, the journal began to print fewer pages and those increasingly consisting of mere filler. In June the editor announced the “merger" of the journal with Natural Life, run by Professor William Windsor, the head of the Boston School of Vitosophy, and in July Rideout no more appeared, the journal, while retaining its name, assumed the volume numbering of Natural Life and added a subtitle announcing that it was “Devoted to Teaching Vitosophy. ‘The Wise Way of Living.' Delineation of Character. Righteousness and Health." Vitosophy was based on the discovery by Dr. Windsor of the “Sand Cure," which called for the regular ingestion of sand with the meals to add grit to the diet. He was othewise a phrenologist. University of North Carolina; Yale University; LOC.